1 of 1 In a medium-size bowl, stir honey, tomato, green pepper, onion, olives, vinegar, olive oil and salt. Set aside until serving. 1 of 4 In a bowl, mix jalapeno, honey and salt. Rub mixture over chicken; cover and refrigerate for 1 hour. 2 of 4 Heat gas grill to medium-high or prepare charcoal grill with medium-hot coals. Grill chicken 11 to 12 minutes, turning halfway through cooking time or until internal temperature reads 160 F on an instant-read thermometer. 3 of 4 Grill polenta about 4 minutes per side or until golden brown and heated through. 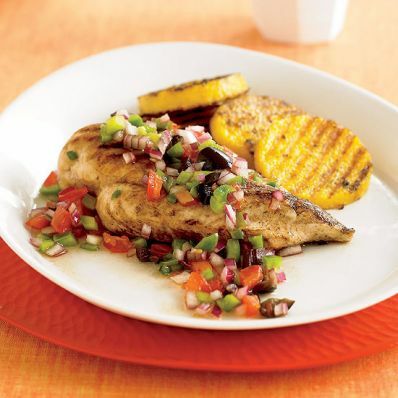 4 of 4 Top chicken breast halves with tomato olivada; serve each with 3 slices of polenta.